On a recent trip to Hawaii, I spent my time stalking the perfect lava flow. 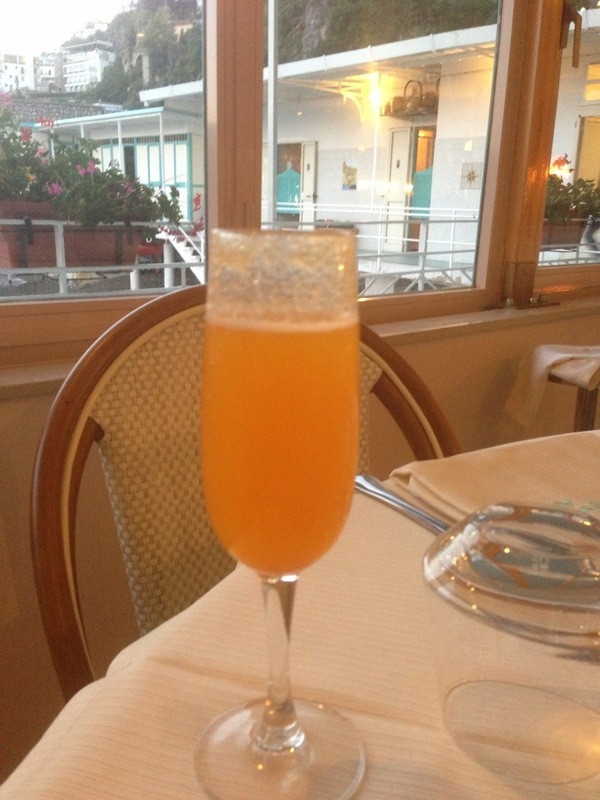 Now that we’re in Italy, I’m changing my focus to the perfect Bellini, a champagne cocktail with peach juice and fresh peach. The good news is that I think I have found the absolutely perfect execution of this little masterpiece. 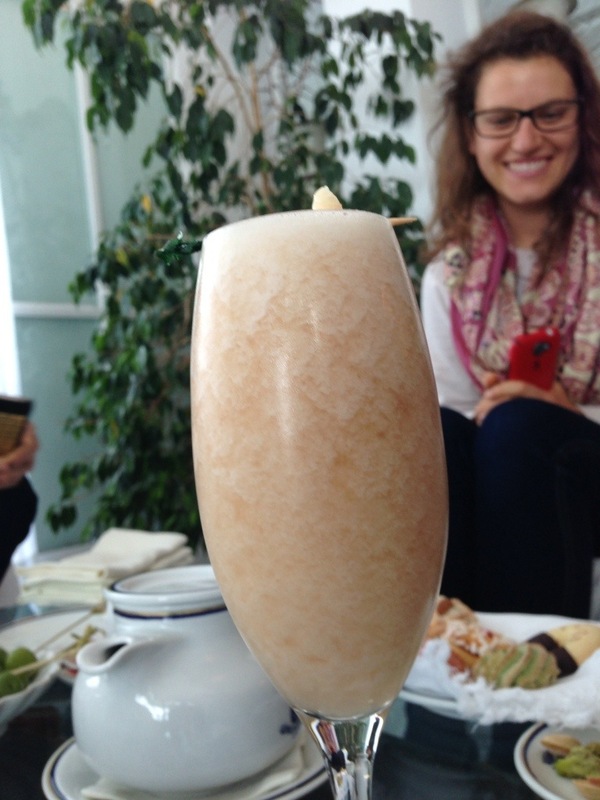 The bad news is that it was the very first one, I don’t think I will ever find a better Bellini than we had our first night here. The service is beyond compare. We just wanted a drink while Kate and Brad were checking out the new digs, and this is the table they laid for us. Those green olives are the best any of us has ever had. 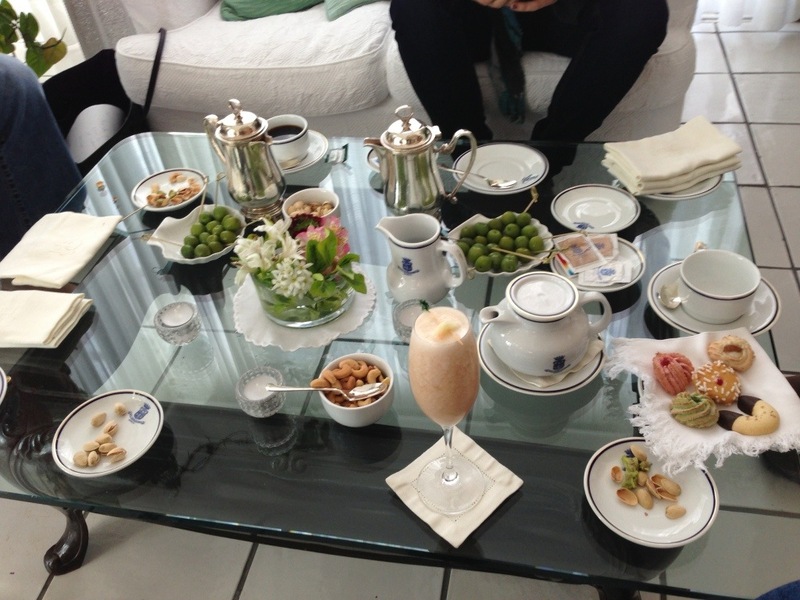 The pistachios were perfect and the cashews were rich and buttery. Later that evening we had dinner in their seaside restaurant, reached by an elevator that goes 8 stories straight down the cliff. The food and the service were impeccable. You pay the bill at the hotel front desk, for some reason. Granddaughter Demi was inquiring about where she might go to buy some coffee for the morning, but it was late and nobody would be open, so the front desk manager made us a care package of coffee, tea, sugar and a carton of cream. You don’t find that kind of courtesy and kindness at the HIlton. More juice, less Champagne, less real fruit. A very poor imitation of what I started with. It’s kind of a shame when the very first example you find of something is the best there is–you can’t really hope for more in the future. It would be like hitting a hole in one your very first round of golf–might as well just quit, it isn’t going to get any better. We ate lunch today in a trattoria our taxi driver was touting–maybe it’s really good, maybe his cousin owns it. 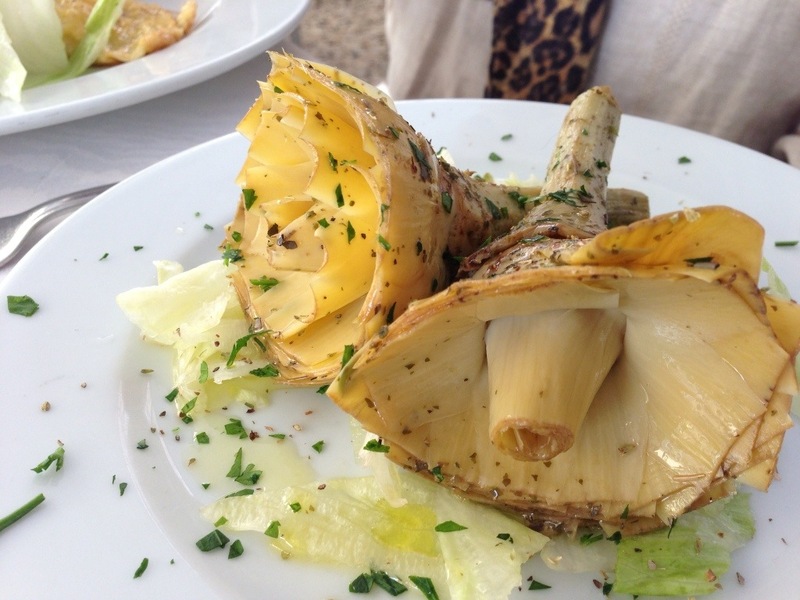 The food in general was decent, but the artichoke was spectacular. This is clearly a different type of artichoke than we get from Castroville, and it was cooked then marinated in oil and spice. Every last bit of it was not only edible but delicious. The weather has not cooperated. We have had intermittent rain showers but think it will be clearing up tomorrow, which is fortuitous because we are planning to get our car out of the parking lot (which is quite a distance away; they pick your car up and then deliver it back when you want it.) and head off to some of the other small towns on this beautiful coast. Amalfi itself was jammed today with tourists who arrived in an armada of tour busses from Rome and Naples. Kate’s daughters, who have been raised essentially as pagans, decided to get dressed this morning and attend Sunday Mass at the large church in town. Chloe announced that they wanted to “Get down with Jesus”. I did enough of that when I was a kid in Catholic school, so I let them go alone. They both are still smiling and beautiful, I guess Jesus is down with them. For some reason I woke up this morning at 5:45. A nap broke out in the late afternoon, but now it’s time for me to get some real rest to be bright and cheerful in the morning. You like me better bright and cheerful.